He’s got an unorthodox way with women and you wouldn’t trust him to cook a pancake. Yet Nói (Tómas Lemarquis) is no idiot. He’s an outsider for sure, but his leftfield view of life and ability to conquer a Rubik’s Cube demonstrates a capability that isn’t conveyed on first impressions. Nói’s father and grandmother both appear to have mental health issues while his mother is conspicious only by her absence. Both literally and metaphorically isolated, Nói sees Iris (Elín Hansdóttir), an employee at his remote town’s petrol station, as the romantic embodiment of his hopes and dreams of escape. 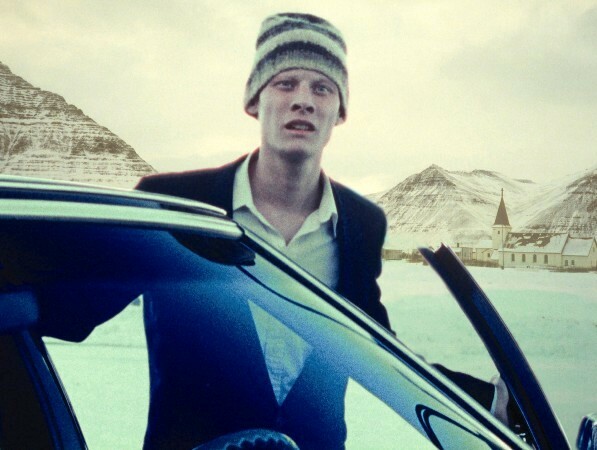 Dagur Kári’s breakthrough focuses on making this almost otherwordly character a realistic force in an unusual but ultimately very conventional smalltown society. The setting for most audiences represents something quietly alien while Nói’s actions aren’t those of a generic coming of age type character, giving the alluring sense of something almost unfeasibly exotic becoming accessible and even empathetic. The film’s light colour palette almost allows Nói to blend into his surroundings, something accentuated by the fact that most of the film’s characters outside of his immediate family are ordinary, everyday people. The downbeat rhythm of the pacing makes his extraordinary personality all the more engaging; Nói’s need to escape seems all the more desperate in the face of the village’s averageness. There’s an underlying sadness as he appears to have the intellectual capacity to escape through conventional academic endeavour, yet his personality flaws, weak social skills and disregard for social norms doom him to his current existence. Despite the film’s languid flow, there’s a contrasting pace to the quantity of scenes that shock or surprise. Occasionally they have the potential to be life changing for the film’s inhabitants but mostly they offer something more impressionable upon the memory than the plot; see Nói blasting icicles with a shotgun, his zoological date with Iris or his father’s karoake rendition of In The Ghetto for evidence. In amidst various other Elvis references (you’ve got to love a cat named Elvis Aaron), one verse of that song neatly references various aspects of Nói’s breaking point, albeit with the doomed cyclical nature of society’s forgotten minorities replaced with an environment that will only repeatedly sink future Nóis. The irony of course is that big city life won’t offer any more to Nói than village life does – he’s inherently not a character that can deal with or cope with the demandingly trudgery of a regular existence. That’s not to say he’s of superior intelligence or morality to others in his town, he’s merely different – Iris, for example, demonstrates a similar level of disaffection that she copes with. Whether that’s by simple acceptance or as part of a longer term strategy is never made clear, but she functions where Nói struggles. Like many films that encircle your thoughts long after the initial viewing, Nói albínói revels in offering more questions than answers. Each person’s interpretation, it seems, could well be every bit as individual as Nói. Nói albínói can be purchased online at Nammi. Nói Albínói’s soundtrack by Slowblow is also wonderful. Rarely is the disc found in stores, you have to find it used. wonderful film! full of surprises and unanswered questions.